As always on my search for new eliquids, I’m keen to try anything, though not being a massive fan of non-tobacco eliquids, I usually steer clear of anything with a fruity name. However, new UK manufacturer and supplier Flavour Factory approached me a couple of weeks ago to sample some of their new fruity sweet flavoured liquids, and I was happy to oblige. Presentation of the product is quite simple and minimalistic, with hand-printed traditional sweet-jar bottle labels, though all very tastefully done, as is their very nicely-designed website (see screenshot below). I am reassured by Flavour Factory that their eliquids contain all-natural ingredients, and that base flavours are sourced from UK and are mixed by a flavour mixologist in a clean preparation environment, likewise here in UK. Bottles (10ml and 30ml) are fitted with childproof caps, and are all safety-labelled in accordance with UK nicotine sales regulations. I tried four 12mg Flavour Factory eliquids in all. The first one up was their Pear Drop eliquid, which having run out of clearomisers I dripped into a Smoktech cartomiser and enjoyed quite a lot, despite the fruitiness of it. A very powerful and zingy (especially out of a cartomiser) and not as acidic as I thought it might be, though much like actual pear drops, it might make you cough a bit (I did). A very realistic and refreshing flavour in all. Next up was the Rhubarb and Custard flavour eliquid, which does what it says on the bottle and is a fairly close representation of everyone’s favourite British pud. Definite tones of rhubarb, and heavy on the vanilla, too, which serves to balance the sharpness of the fruit flavour. The Tropical Fruit Crush eliquid was probably my favourite out of all the fruity liquids, as even for a non-fruit vaper, I thought that this one was the most refreshing of them all. Powerful blasts of mango, pineapple and maybe a couple of papaya made for a sharp sweet flavour offset by a nicely bitter base. A well-rounded and three-dimensional eliquid flavour that I enjoyed a lot. Peppermint was the flavour I tried last of all, and this was my top-scoring flavour. I’m always in search of good menthol eliquids and am regularly disappointed by mixers that try too hard with them by adding eucalyptus or clove flavours. Peppermint is a no-nonsense “extra-strong mint” flavour that’s powerful enough to blow away the cobwebs, though doesn’t make your eyes water. Rich and soft, I liked this one no end. Thanks to a slightly thicker PG/VG consistency, these eliquids from flavour factory have a strong enough throat hit at 12mg yet are softer on the throat and less harsh than some other fruit flavours I have tried. My only small concern was that the thicker mixture might cause problems with clearomisers, though I’m assured by the manufacturers that they have tested the liquids in clearo devices and have noticed no issues. It’s clear that Flavour Factory UK are doing their best to set themselves apart from existing liquid suppliers by offering a wide variety of novel, eccentric and often exclusively British flavours such as “Cider” and Dandelion and Burdock”. In a market of boring flavours and generic products, this is a positive step forward and I only wish there were more suppliers doing the same. 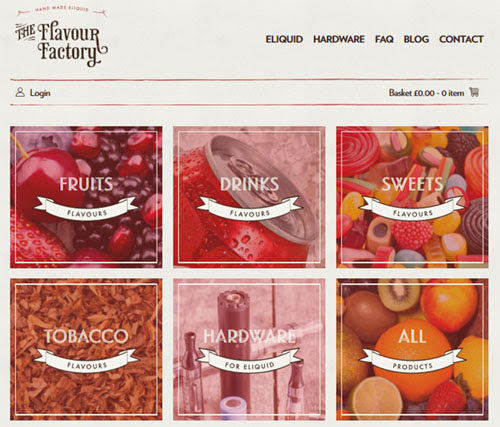 Flavour Factory eliquids are available in either 10ml (£4.99) or 30ml (£9.99) bottles of 0mg, 6mg, 12mg, 18mg, 24mg nicotine strength and are for sale only to customers over the age of 18. Visit the Flavour factory website here for further details. Copyright ecigfind.com © 2019. All Rights Reserved.